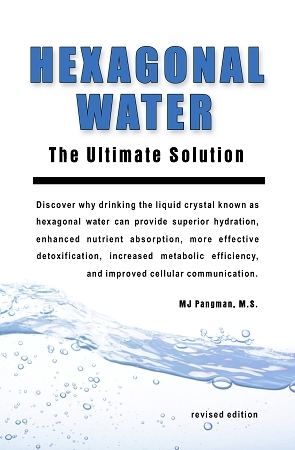 Hexagonal Water: The Ultimate Solution documents the life-giving properties of water’s hexagonal molecular structure. It explains the difference between unstructured water and the living crystal known as “hexagonal water.” In language that is easy to understand, Hexagonal Water explains why crystalline geometry is the life-giving factor, capable of supporting superior hydration, enhanced nutrient absorption, more effective detoxification, increased metabolic efficiency and improved cellular communication. In addition to outlining some of the research demonstrating the efficacy of hexagonal water, Hexagonal Water discusses the connection between water, aging and disease. It reveals the link between loss of organization in the water within our bodies and illness, elaborating on a wide variety of health conditions that routinely improve, by drinking hexagonal water. If you are interested in understanding how something as simple as organized (hexagonal) water can impact your health, youth and vitality, this book is a must. You will begin to understand why thousands of individuals are choosing to drink hexagonal (structured) water every day.